The March 1961 cover photo of Wheels magazine in Australia gives us our only full-color look at this right-hand-drive Surrey-style CJ-3B built by the Willys factory in Brisbane the previous year. Thanks to Bruce Teterin for scanning the cover. 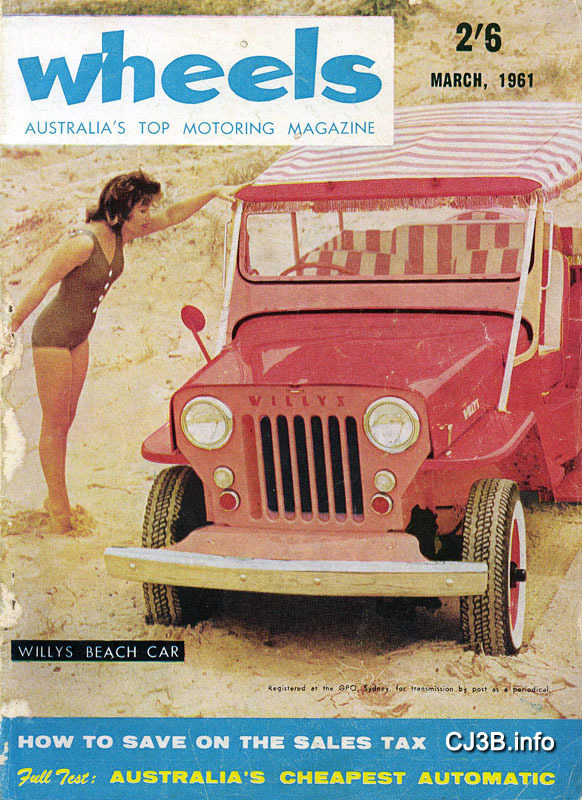 Unfortunately, aside from the caption "Willys Beach Car" it provides no further information; there is no article about the vehicle inside the magazine. Probably the editors were just looking for a photo with a bathing beauty for their cover, in the waning days of summer downunder. 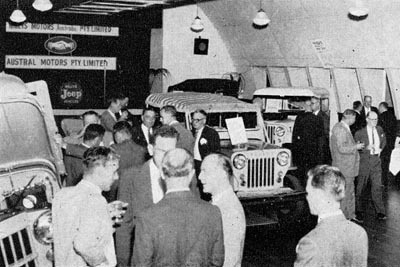 This Jeep was apparently a one-off project, coming off the assembly line in Brisbane on 25 August 1960 (see Willys Australia Serial Numbers on CJ3B.info.) Clearly WA thought there might be a market for a copy of the DJ-3A Surrey Gala model, including the panel behind the chrome front bumper, the windshield straps, surrey roof and rear-mounted spare. But I have seen no documentation of any further production. 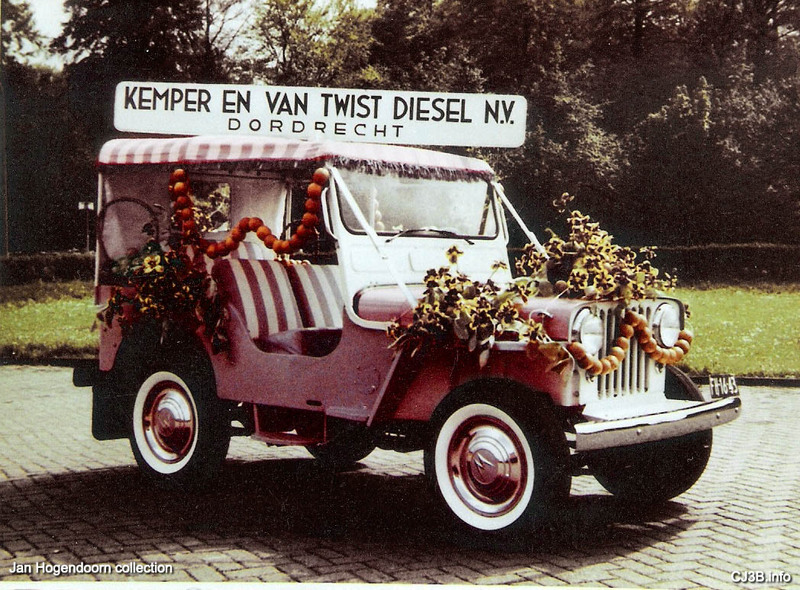 Why didn't they just buy the 2WD Gala from Willys, as was done in the Netherlands (230K JPEG)? 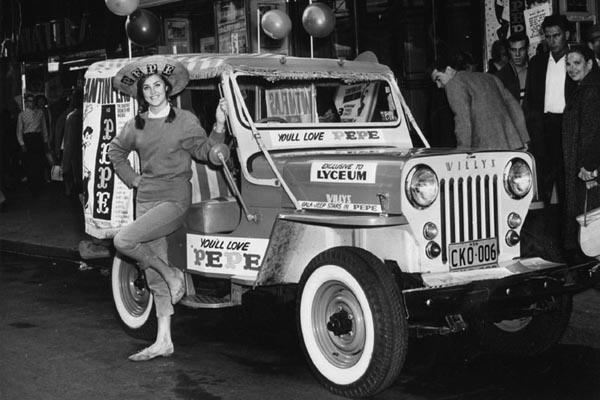 I'm guessing that by 1960 Willys Australia still had a significant number of unsold CJ-3Bs from the one thousand they had imported in crates in 1958, and were looking for new ways to promote them. 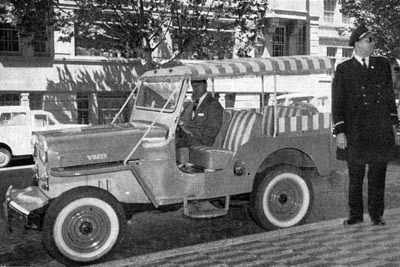 In March the beach car also appeared in a photo in Willys Australia's publication Jeep News , identified as the "Gala Jeep" despite the fact that it was not an actual Willys DJ-3A Gala. 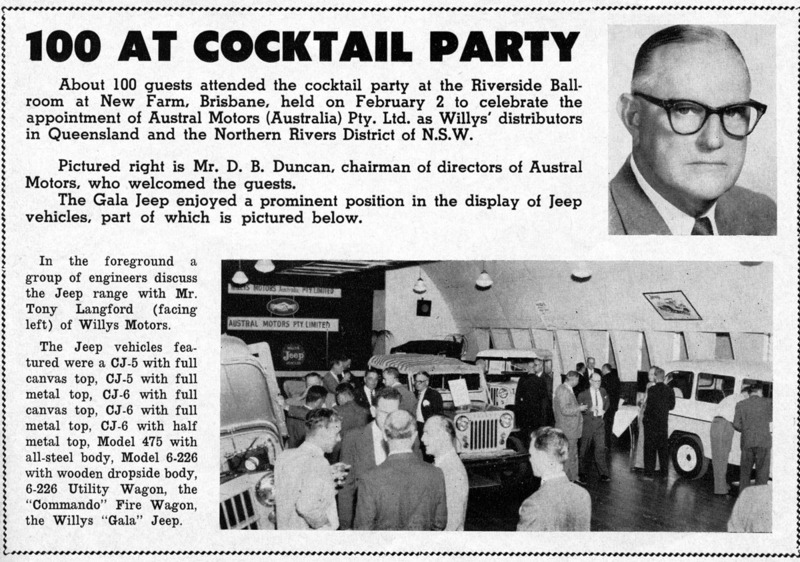 It was one of the vehicles on display at a cocktail party (360K JPEG) celebrating the appointment of Austral Motors as Willys' Queensland distributor. 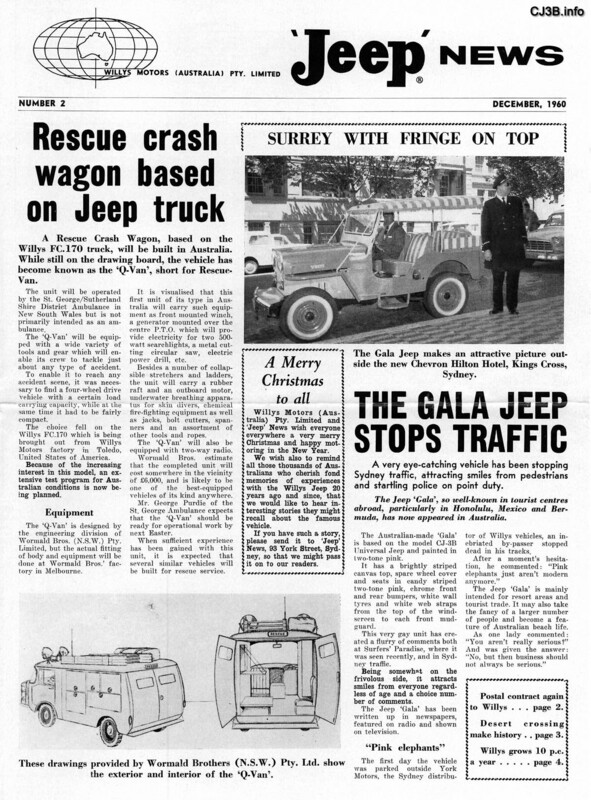 The "Gala Jeep" had already been on the front page of Jeep News , December 1960 (500K JPEG) when it was pictured at the new Chevron Hilton Hotel in Sydney. According to the brief article, the unique vehicle had been making appearances around town and getting favorable comments and press reports. The same front page included an article about The Q Van FC-170 Rescue Truck. Thanks to Vaughn Becker for scanning Jeep News . Page 3 (330K JPEG) of the same issue of Jeep News summarized some of the appearances the demo unit had been making to aid local charities. 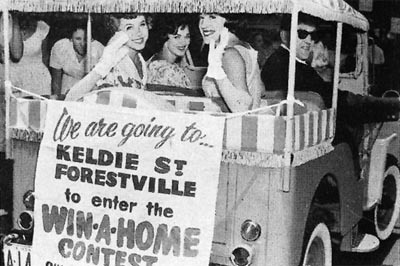 The photo showed it carrying some young ladies from a modelling school, heading for a beachware fashion show to promote a charitable raffle. The Australian taillights were significantly different from the Hall taillights used on both Surreys and CJ-3Bs in the U.S. after 1955. 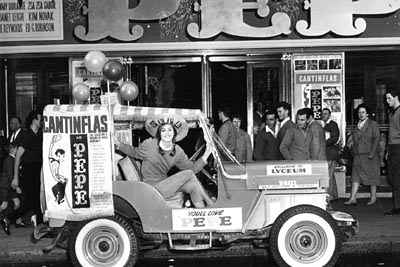 The CJ-3B Gala was also turned into a promotional vehicle for use in an unlikely marketing arrangement with a new Hollywood motion picture called Pepe , one of the most-hyped movies of 1960-61. 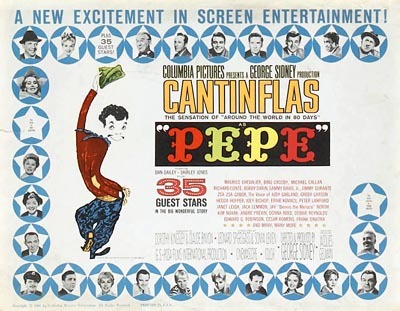 The popular Mexican actor Cantinflas, who had recently been a hit in Around the World in Eighty Days , played the title role in Pepe , and had a funny scene with a bunch of Gala Jeeps at the Las Brisas hotel in Acapulco. 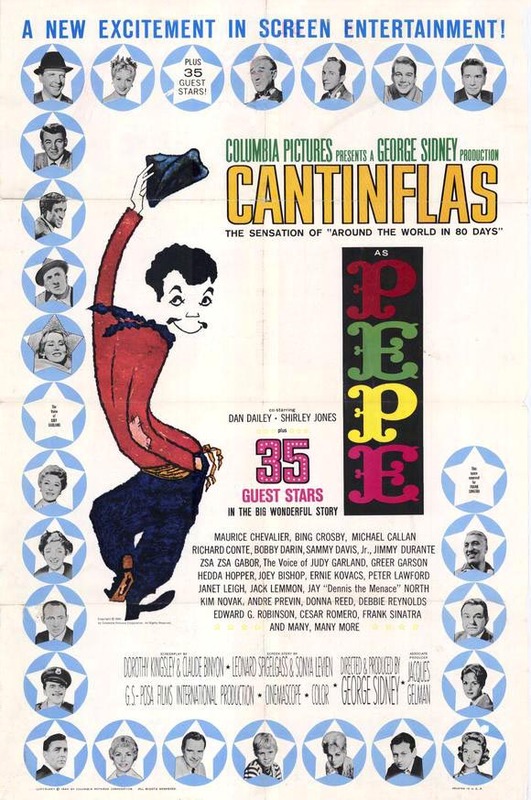 The poster advertised "35 guest stars" in cameo roles, but the film wasn't successful with either critics or audiences. Leonard Maltin's Movie & Video Guide calls it an "incredibly long, pointless film.... this one's only if you're desperate." See Jeeps in Pepe on CJ3B.info. The photos of the Jeep appear to have been taken outside the Australian premiere of Pepe . The date is unknown, but the film had opened in the U.S. in late December 1960, and in Europe in March 1961. Unfortunately this unusual high-hood Jeep seems to have vanished almost as quickly and quietly as the movie. 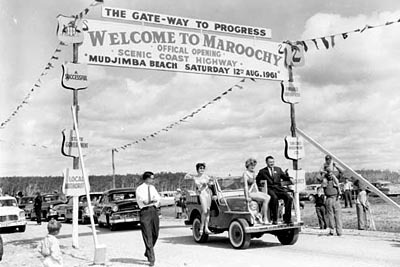 The last picture I've seen was taken on 12 August 1961, at the official opening of the Mudjimba to Marcoola (about 5km) section of the Scenic Coast Highway, north of Brisbane in Queensland. Apparently somebody at Willys figured it was another good photo op for the Surrey, carrying the "Sungirls" and the Minister for Public Works and Local Government, H. Richter, who performed the opening ceremony. 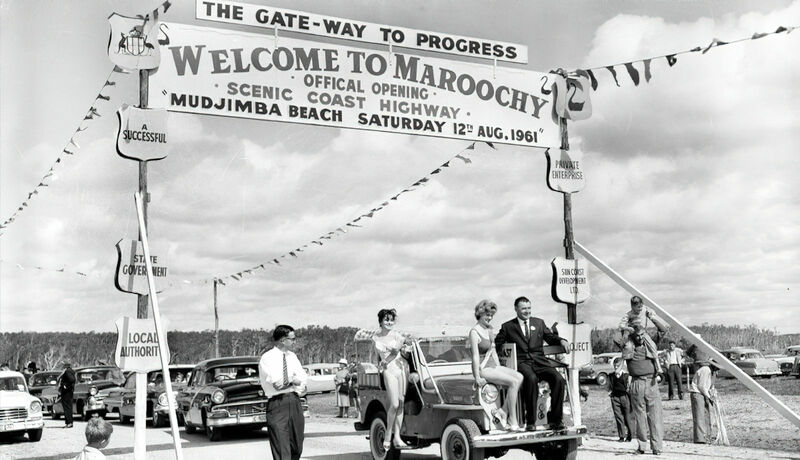 Photo by Robinson Studios, courtesy of Sunshine Coast Libraries, where it was found by Rod Walker. 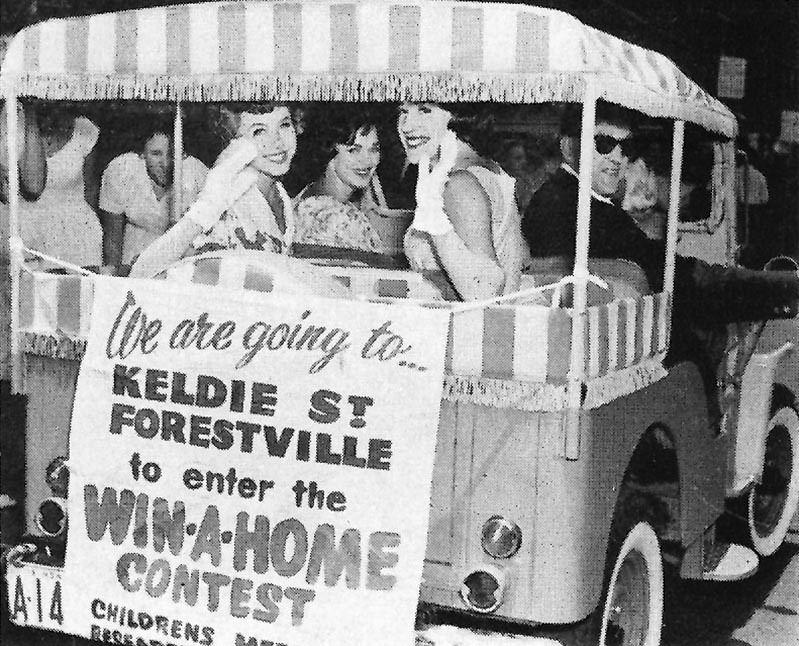 By August, summer was about to arrive downunder, so Willys was probably still hoping for some orders for more of the Gala Jeeps. But the evidence I have seen so far suggests it was not to be. Willys in the U.S. had also built at least two Surrey-style CJ-3Bs by 1961, one in pink and one in blue. Matchbox produced a 1/64-scale toy Surrey in 2001 that could have been based on the Australian Gala! And Willys of Brasil produced a CJ-5 Surrey. See more Jeeps in Australia on CJ3B.info. Return to Unusual CJ-3B Photos.